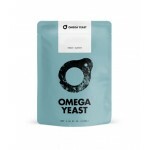 Omega Yeast produces fresh, high quality and pitch-ready liquid yeast, enabling homebrewers to respond to the growing trends with a wider selection of yeast strains that allows for wider variety of flavors and styles of craft beer. Omega Yeast West Coast Ale I OYL004 Popularly called "Chico," West Coast Ale I is a reliabl..
Omega Yeast Irish Ale OYL005 Ireland’s storied stout is thought to be balanced by this dry,..
Omega Yeast DIPA Ale OYL052 A strong fermenter popularly referred to as "Conan," the DIPA A..
Omega Yeast Tropical IPA OYL200 Tropical IPA is a unique Saccharomyces strain formerly clas..
Omega Yeast Hefeweizen Ale I OYL021 A classic German wheat strain, Hefeweizen Ale I is a cl..
Omega Yeast Kolsch II OYL044 Kolsch II is warmer fermenting lager-like ale strain that's li..
Omega Yeast British Ale I OYL006 A productive, brewer-friendly top cropper attributed to a ..
Omega Yeast British Ale V OYL011 A good top cropper thought to be from a famous Manchester ..
Omega Yeast British Ale VIII OYL016 A ridiculously thorough flocculator thought to be from ..
Omega Yeast Bayern Lager OYL114 The Bayern Lager strain is clean, crisp and ferments well a..
Omega Yeast Belgian Ale A OYL024 As one of the few highly flocculent Belgian ale strains, B..
Omega Yeast Belgian Ale W OYL028 An eruptive top cropper displaying nice fruit and rustic p..
Omega Yeast Belgian Saison II OYL042 Thought to originate from a small, sophisticated, Belg..
Omega Yeast C2C American Farmhouse OYL217 C2C American Farmhouse is a coast to coast blend ..
Omega Yeast Brett Blend #1: Where Da Funk? OYL210 One Brett-famous Colorado brewery strain,..
Omega Yeast Brett Blend #2: Bit O' Funk OYL211 Brett Blend #2: Bit O' Funk contains the two..
Omega Yeast Brett Blend #3: Bring on Da Funk OYL212 Brett Blend #3: Bring on Da Funk consis..
Omega Yeast All the Bretts OYL218 A blend of nearly every Brett in our collection. Use All ..
Omega Yeast HotHead Ale OYL057 A highly flocculent Norwegian ale strain with an astoundingl..
Omega Yeast Voss Kveik OYL061 Voss Kveik's orange-citrus notes present throughout its wide ..
Omega Yeast Hornindal Kveik OYL091 Hornindal presents a tropical flavor and aroma of fresh ..
Omega Yeast Saisonstein's Monster OYL500 Saisonstein's Monster is an Omega-original, geneti..
Omega Yeast Lactobacillus Blend OYL605 A Lactobacillus brevis and plantarum blend that is c..